The 10 day shark trip is for the serious photographers and film makers, or those who have a passion for the Great White Shark and just want to spend time getting to know and understand them. On these trips you will get to recognize the sharks, and perhaps even get to name one! Don’t just dream of taking awesome shark pictures…..do it! Wake up every day knowing you are going to spend another day with the great white sharks in their natural habitat. A Jubilee is a time of celebration. Why not celebrate June spending time on the ocean with the Great White Sharks. Late June has always been a very good time of the year for shark cage diving. The visibility of the water is good and the winter weather is mild. False Bay is also a protected bay, and so we are not affected as much as other shark area’s by the Cape Storms. This time of the year is the peak time for the sheer number of Great white sharks. The sharks are very active round the island and are generally very curious animals, making it ideal for surface viewing and shark cage diving. Get to learn the different sharks by name and discover each one’s unique characters. 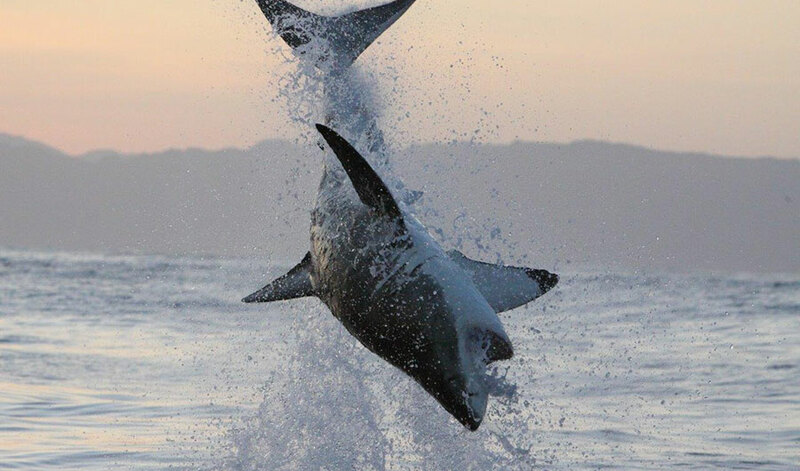 June is also an ideal month for watching the great white breaching behaviour of the great white shark. If you have fast fingers and are quick enough, you may be able to take that “perfect breaching shot” you have always dreamed about. June to August is particularly good for the breaching behaviour of the great white shark. What makes these months so special is the breaching and the predation behaviour, and this is what our main focus is on. No where on earth is the predation activity so intense during this short shark season, as in Seal Island,False Bay. Predation events range from several to in excess of 30 on a single morning. It is not to be missed! As we are an eco-sensitive operation, we want to get as close to the “action” as possible, but will not disturb this natural phenomenon, chase down sharks or cut across a predation event. Join us for a 10 day shark cage diving, shark breaching and natural hunting experience! Book now for an experience of a lifetime! Quality self catering accommodation in Simon’s Town. Should you prefer we can also arrange your stay in a guest house or hotel in Simon’s Town. Weather statistics predict that on average 8 out of 10 days meet the minimum conditions for going to sea. However, it is at the discretion of the skipper of the boat to decide if conditions are unsuitable for sea work. If we cant go to sea, then why not spent the day exploring Cape Town’s many world famous landmarks, such as Table Mountain, Cape Point, Boulders Penguin Colony or a township tour on a bicycle?